Richard Fornander arrived at The Emerald Peek Rehabilitation and Nursing Center in October of 2018. Mr. Fornander suffered from a blood infection, which ended in the result of the absence of Mr. Fornander’s left leg. Upon arrival, Mr. Fornander was greeted by our nursing team and concierge. Although Mr. Fornander was a little under the weather on his first day here, he still managed to keep a positive attitude as he adjusted to our community. Within his first few days, he went on to meet with our rehabilitation team, dietary staff, and social worker. Mr. Fornander appeared to be very motivated with anticipating goals to rehabilitate and return home safely. With Mr. Fornander’s condition, it would be challenging to perform any basic life tasks, such as keeping proper hygiene, grooming, eating, or dressing. After an initial evaluation with Richard and Agniezka from physical therapy, and Kiran from occupational therapy, it was determined that Richard would have to perform special exercises six times a week. They set short term goals to be reached by October 26, 2018. The goals would be for Mr. Fornander to safely perform functional transfers in and out of bed, using contact guards/side rails with reduce risks of falls. Also, ambulate using his right leg up to 50 feet using a rolling walker and contact guard assistance. This is so that he would be able to increase his strength and independence with all functional ambulation. With these exercises being conducted consistently, he would be able to tolerate wearing his left leg prosthetic for limited time. Long term goals included safely and efficiently performing all tasks with independence using verbal cues for safety awareness, proper sequencing, and unlimited ambulating. By this time, he was sought to safely walk up and down 15 stairs with supervision and verbal cues to assure safety. For occupational therapy, Mr. Fornander would begin practicing toileting tasks handle bars for assistance. He would practice how to safely dress and prove all functional mobility by November 1, 2018. Mr. Fornander was no beginner to hard work, as he owned his own private business call the Laser Tech Fabricator in Cold Springs, New York. With that being said, it is self-explanatory that he was a handyman, very active, and determine for success. As Mr. Fornander kept pressing forward, he without a doubt had reached his goals by October 29, 2018. He was ambulating up to 40 feet, with the help of verbal cues and contact guard assistance. He was transferring safely in and out of bed, with the use of side rails and performing regular daily activities with less verbal cues. On November 5th, 2018 Mr. Fornander was ambulating up to 75 feet. At this time Mr. Fornander was not yet evaluated for his left leg prosthetic; however, with his motivation and the extra help and effort to keep moving forward, he was still able to perform these tasks safely and efficiently. Mr. Fornander was evaluated for his left leg prosthetic two weeks later, and it was time to set new goals, as he would be awaiting the delivery of his prosthetic. 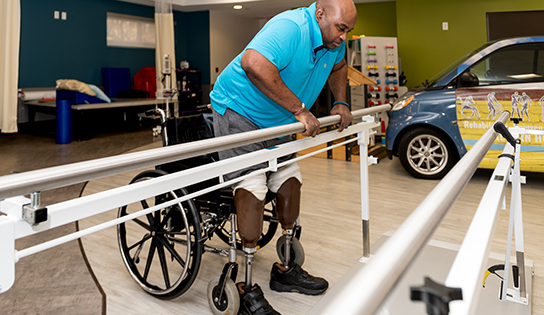 As Mr. Fornander was awaiting his left leg prosthetic, he became a little discouraged under the impression that he would not receive his prosthetic until after discharge. On a normal day at The Emerald Peek in December, he had a conversation with our concierge expressing his feelings about this obstacle. Mr. Fornander longed to go back to work and return home. He felt like giving up. He started to believe that after all his hard work, he would not be able to reach his goals of being able to function under these circumstances. But here at The Emerald Peek, we do not take no for an answer. Dr. Neitchswat and the rehabilitation team made several calls to the medical director of the insurance company, and finally Richard Fornander was granted with his new prosthetic. By December 4, 2018, Mr. Fornander obtained his prosthetic and resumed to doing daily activities and exercises. By December 11th, he was able to ambulate up 175 feet, then graduating to ambulate unlimitedly. He is able to stand/tolerate using his new prosthetic for more than two hours. With the increase of his strength to stand, he’s able to dress properly. He is even able to perform ambulation on level and unleveled surfaces with the help of the rolling walker!